Trilliums are among my favorite of all plants. There are few plants that lend such a strong sense of place to both the wild settings where they naturally grow and to the gardens of the discerning. Their simplistic, elegant form lends a dignified air to woodland and shaded gardens and they have few rivals among the rich spring flora of the eastern U.S. and beyond. I have been studying Trillium in the wild and under garden conditions for the last fifteen years, and one of my life goals is to see all of the species in the wild (hopefully numerous times). Only by visiting numerous populations of a given species can one truly appreciate the extreme variation to be found. Although there is no such thing as a bad Trillium, my personal favorite Trillium species are the sessile species, and particularly those of the Southern U.S. Not only do these species have some of the most beautifully mottled and highly colored foliage in the genus, but they are also early risers, and if you have the conditions to suit them, they bring some spring cheer starting in late January-early February and last well into spring. Trillium decipiens is the first species to start into growth, and with this years mild winter, growth was evident the second week of January. This is either T. decipiens or T. underwoodii from Alabama. The stems continue to slowly elongate, so I am inclined to think it is the former. It will be easier to tell when the flowers open. Trillium decumbens is one of the most distinctive species. After flowering, the leaves rapidly mature and senesce, leaving only the developing berries (the Trillium fruit is a true berry). The seeds are large compared to other Trilliums. This species is relatively easy to grow from seed. 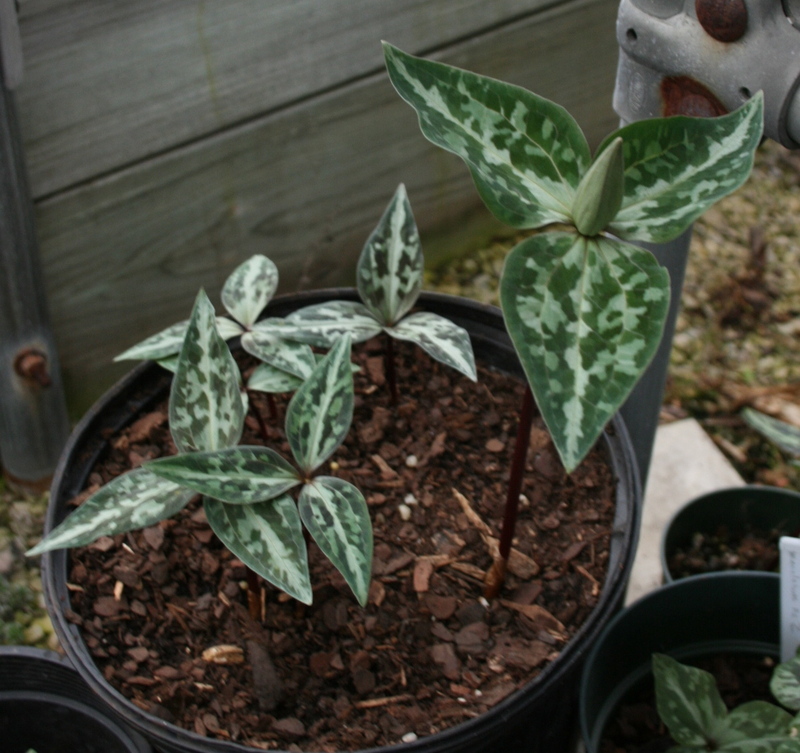 The pattern of the mottling is distinct among trilliums and adds to the unique beauty of this species. There is a yellow flowered for of this species which I would love to grow. This is Trillium ludovicianum from central Louisiana. I have yet to see this species in flower and eagerly await the first flowers to open on these plants. 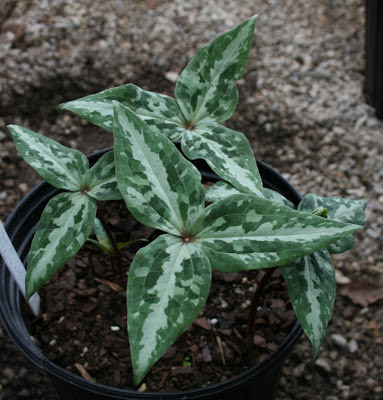 This species is closely related to, and suspected to hybridize with Trillium cuneatum. Perhaps the least well-known sessile Trillium is T. gracile. This species occurs in Louisiana and extreme east Texas. The pictured form is from Newton County, Texas. This species emerges very early, but flowers rather late. These pictures were taken on April 21, 2011.